There’s an Amish market about 15 minutes from me that makes and sells the most delicious looking Whoopie Pies. So far I’ve resisted; they’re a bit steep at $5 each —and you know I could never buy just one! A traditional Whoopie Pie consists of two bun-shaped pieces of chocolate cake with a white creamy filling sandwiched in the middle. And while that’s a great combo, I figured if I was going to make Whoopie Pies… why not take it up a notch! Here’s my version, made with brownies & raspberry buttercream, just in time for Valentine’s Day. 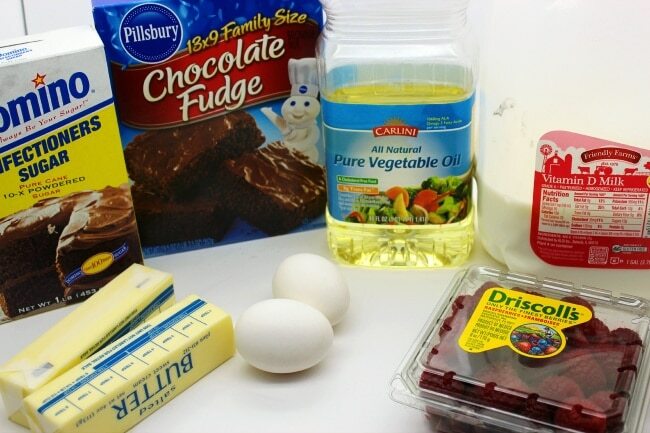 Prepare brownies according to box directions. Allow to cool. 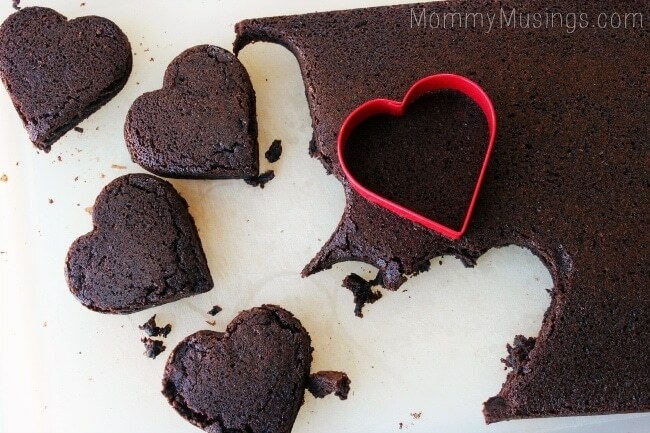 Remove from pan and cut as many heart shapes as possible with cookie cutter. Puree raspberries in food processor or blender. 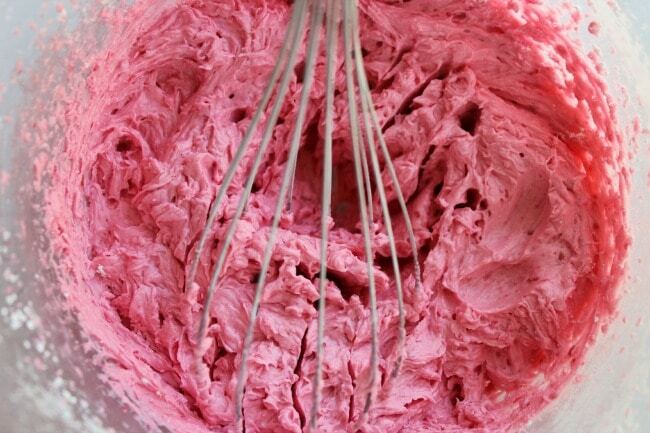 In a medium bowl, cream butter and raspberry puree. Add in powdered sugar 1 cup at a time. Mixing until smooth and creamy. Transfer filling to piping bag. Pipe filling around the edge of one of the brownie hearts. Then fill in the middle. Top with another brownie heart, gently pressing down to make a sandwich. For the finishing touch, dust the tops with powdered sugar. Cool idea! I haven’t made homemade whoopie pies in years…they look so yummy! I made homemade whoopie pies before Christmas for my son. 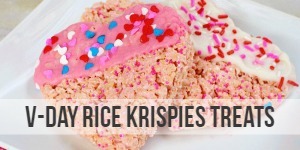 I’d love to make heart-shaped ones for his class for V-Day! So super cute AND yummy! 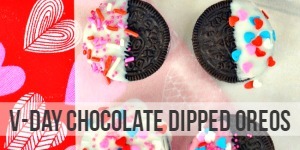 I can’t wait to make these for my little guys for v-day. 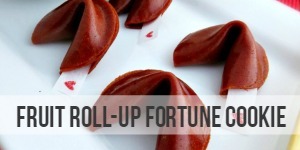 Those look delish and perfect for Valentine’s Day! These came out amazing and I bet they taste really good, too! Those sound crazy amazing! 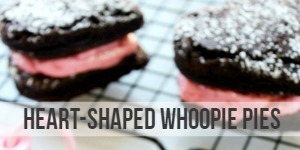 I love whoopie pies anyway but to use brownies instead- those are my weakness. Yum! These look SO good! I love the heart shaped with pink filling, super cute. I have never had a whoopie pie so I think it is about time I try one! You know, I’ve never actually made a whoopie pie or had one! These are too cute! These are perfect for Valentine’s Day. 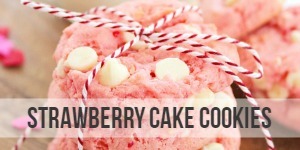 I may have to make some myself. These look so incredibly good, I know my boys would gobble them up! Totally yum! I bet the raspberry really sets them a step above too! 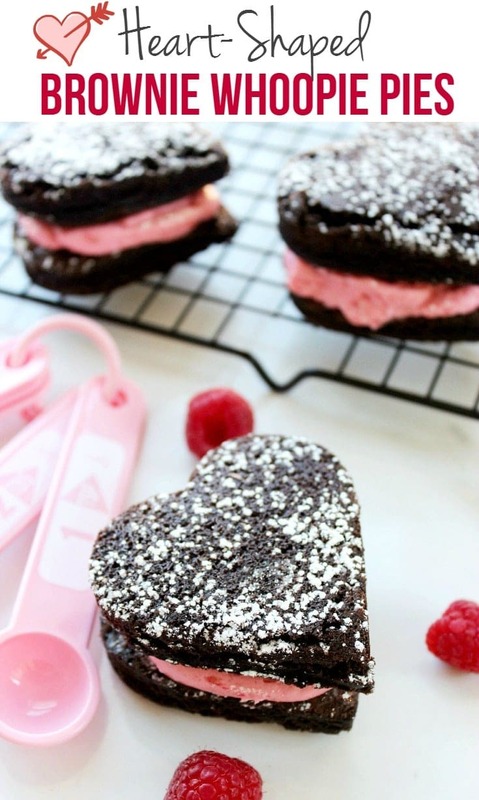 YUM — I adore chocolate and raspberry together…. one of my favorite ways to eat chocolate! These look yummy and what a festive little treat for the upcoming holiday. The taste and shape of love. The upcomming parties will have this receipe added on priority.